We have launched the T-shirt Yarn Project! Inspired by recycling, up-cycling and craft, we are using donated T-shirts to create yarn in order to make new handmade products. 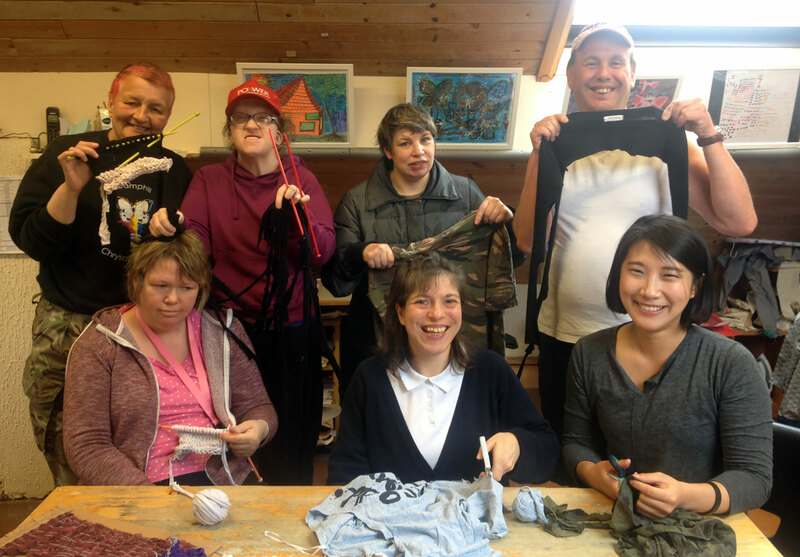 Part of the T-shirt Yarn Project will see the launch of an in-house pop-up ‘Arts Café’ set up by and for residents, co-workers and volunteers every Friday afternoon. All participants will meet to create craft relating to arts therapy. It will be a time to meet and chat over a cup of tea and create a little magic. We will use the stress-relieving techniques of crochet, knitting and braid making to create the large rug for our ‘social room’ and because making a braid is one of the simplest techniques, everyone with various abilities and disabilities can get involved. The inspiration behind the T-shirt Yarn Project also comes from Knit For Health and Wellness study and book by Betsan Corkhill, which discusses the therapeutic benefits of knitting. By reducing stress each Friday afternoon, Camphill Communities Milton Keynes will be knitting for health. If you would like to get involved, please drop in your old T-shirts to our onsite Shop and be a part of this truly inclusive community project.